MSC Software's Student Editions will give you the advantage you need to be successful in today's job market. Predict your future and download MSC's simulation software products today FREE! With quick access to a large amount of tutorials, webinars and example problems, you can effortlessly train yourself. MSC Software's Student Editions will provide you with the simulation tools to accurately and reliably predict how your designs will behave in the real world. Employers are constantly relying on simulation software to help eliminate slow and costly physical testing, and with experience right out of school, you will be ready to begin your career in no time! MSC Apex is the world's first Computational Parts™ based CAE system capable of performing deformation, stress and normal modes analysis. 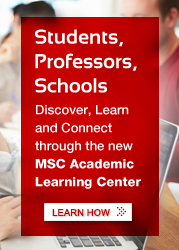 Use MSC Apex for reasearch or teaching. MSC Apex is ideal for courses covering mechanics of materials, advanced structural analysis or natural frequencies and mode shapes. MSC Nastran is the world's most widely used Finite Element Analysis (FEA) solver, and Patran is a widely used modeling software that makes model creation and post-processing easy. When it comes to analyzing stress, dynamics, or vibration behavior of real-world complex systems, manufacturers of everything from parts and assemblies to full vehicles choose MSC Nastran because of its high reliability and accuracy.